The Google Knowledge Graph is a system that was launched in May 2012. It understands facts about people, places and things and how these entities are all connected. The Knowledge Graph is used both behind-the-scenes to help Google improve its search relevancy and also to present Knowledge Graph boxes within its search results that provide us consumers with direct answers. You and I know the Knowledge Graph as the little box/panel or card that appears on the right hand side of the Results page or at the top of the results below the AMP carousel on mobile devices. So, as small business DIY SEOers, how can we use the Knowledge Graph to our advantage? 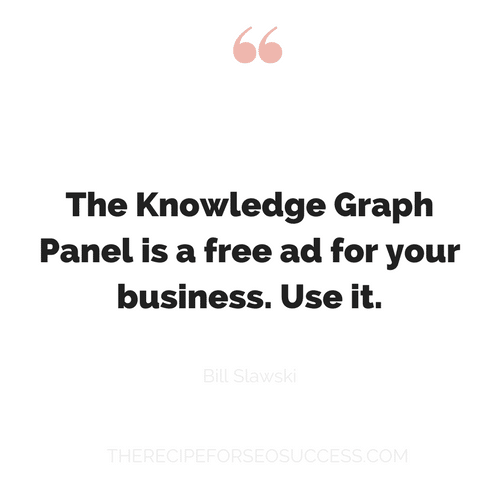 Today, I’m talking to legendary SEO guru Bill Slawski to get the lowdown on all things Knowledge Graph. What does ‘things not strings’ mean? Does the Knowledge Graph actually damage our site? With more than 20 years of SEO experience and a Juris Doctor Degree, Bill is the foremost expert on Google’s patents as related to SEO. Bill is the Editor of SEO by the Sea, a prominent search engine optimization blog, where he is the author of over 1,000 posts. Bill’s experience includes Fortune 500 brands and some of the largest websites in the world. Bill is a contributing author to Moz and Search Engine Land. 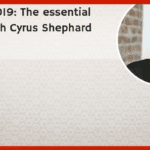 In 2014-2016, he spoke at industry-leading conferences about topics including search engine algorithms, universal and blended search, personalization in search, search and social media, and duplicate content problems, structured data and schema. And big thanks to Caylow for their lovely review. KATE: The Google Knowledge Graph is a system that launched in May 2012. It understands facts about people, places and things and how to get these entities all connected. The knowledge graph is used both behind the scenes to help Google improve its search relevancy, and also to present knowledge graph boxes within its’ search results to provide us consumers with direct answers. [00:00:30] You and I know that knowledge graph is a panel or card that appears on the right hand side of the results, or at the top of the page results below the amp carousel on mobile devices. So, a small business DIY SEO is how can we use the knowledge graph to our advantage. 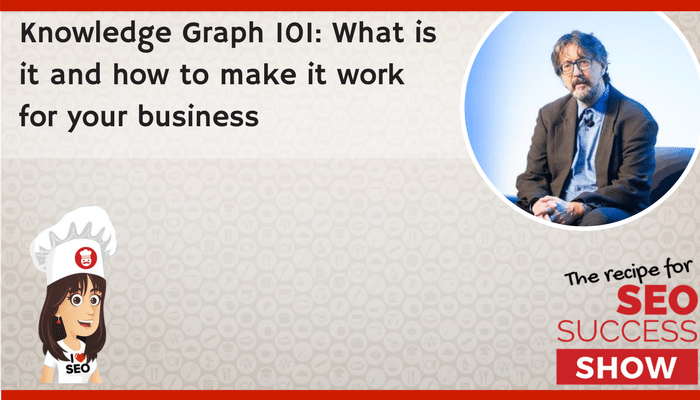 [00:01:00] Today I’m talking to legendary SEO guru Bill Slawski, to get the low down on all things knowledge graph. 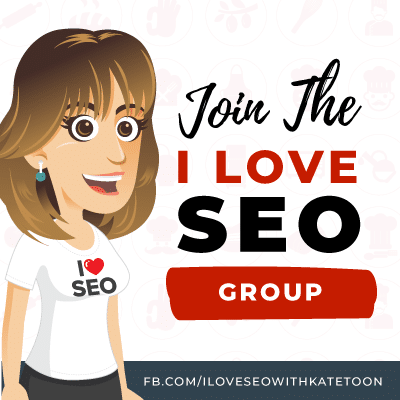 Hi, my name is Kate Toon and I’m the Head Chef here at the Recipe for SEO Success, an online teaching hub for all things related to search engine optimization and I love SEO. Today I’m talking with Bill Slawski, who’s a bit of a hero of mine. I’ve just been flattering him, and it was quite awkward. 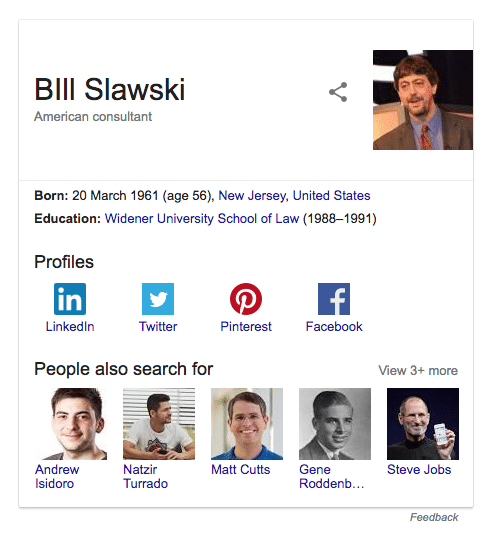 [00:02:00] With more than 20 years of SEO experience, and a Jurist Doctor degree, Bill is the foremost expert on Google’s patents as related to SEO. Bill is the editor of SEO by the Sea, a prominent search engine optimization blog, where he is the author of over a thousand posts. Bill’s experience includes Fortune 500 brands and some of the largest websites in the world. Wow, welcome to the show Bill, that is one hell of a bio. KATE: Did I miss anything. BILL: I think you got most of it. [00:02:30] Now Bill helped me out when I was first starting out here, maybe five or six years ago when I went on my own, and he had a good chat with me for which I am eternally grateful. So, it is absolutely awesome to have you on the podcast today. Now, what I usually do at the beginning of the podcast is I like to talk about any interesting SEO or digital marketing related news that you’ve read this week. Have you … what have you been reading on line this week Bill? [00:03:00] Well unusual, I’ve been reading some patents. I do that, I search through them to see what’s new. I noticed a new one from Apple, don’t have a search engine, but they’re doing a lot in the world of advertising and providing information online, and this was about GEO Fences. [00:04:00] The GEO Fence is a virtual location that is mapped out that you can find when people enter or leave, and if they’ve entered one of these GEO Fence spaces, you can advertise to them. You can send content to them, alerts, notifications, you would put a GEO Fence around a neighbourhood, around your office, around an event like the SuperBowl, so that when they enter that space, they get a message from you. BILL: Yes, Microsoft has a few that look like those billboards that were talking to Tom Cruise in that movie. KATE: Yeah, it’s terrifying isn’t it, to be honest. Moving on from Apple and the terrifying future that faces all of us, let’s get into knowledge graph, much more comfortable and safer ground. I think a lot of people get confused and mix up the knowledge graph with the panel that you see on the right hand side of the screen. The knowledge graph is the engine that powers the panel. The panel is the results, right? BILL: It’s not just a Google thing, right. [00:05:30] We’re obsessed with Google over here in Australia because it has such a big market share and poor Bing and Yahoo don’t really get a look in, we’re all obsessed with Google. But when people talk about knowledge graph, they often talk about the things not strings approach. [00:06:00] It means that Google is trying to recognise and pay attention to entities. An entity is a person, place … a specific person, place or thing. Like an idea, like democracy is an entity. So, better word, different word is concepts, and Microsoft often refers to entities as concepts. [00:07:00] Knowledge graph, back in 2005 or so, Google was working on something they called the fact repository, which was like the knowledge graph, it was sort of knowledge graph’s grandfather. The idea was that they would recognise things and be able to refer to them. Be able to track them in something like Google Trends. When somebody searched for a specific entity, a person or a place, they might recognise that person or place in the query, and speed up how quickly the search engine responded to a search word by recognising maybe a number as opposed to that entity. [00:08:00] The idea was Google wanted to move on from just matching words on documents to words within querys. They wanted to capture the meaning of searches better. [00:08:30] So, if you search for say Arnold Schwarzenegger. He was in movies as the Terminator, as Kindergarten Cop, as a few different characters, and Google would want to show you all those results, all the things that he played rather than just any pages that had the names Arnold Schwarzenegger on it. [00:09:00] Yeah, that makes a lot of sense. I think one way, a simple way for normal humans to understand it is to remember in the olden days when people had sites, all the pages would be hard coded. I mean like literally you know hard coded page, and then obviously we all moved to databases where elements given an idea and you could pull together pages from different things, you know different columns and create contents. So it’s kind of separating form from function and relating items to each other. [00:09:30] They’re trying to do a better job capturing meaning. Trying to understand what you’re actually asking for, and if you’re not using the words that are used on the page of a website, but you mean the same thing, they want to show that website anyway. KATE: Yeah, that makes great sense, and also, wasn’t Kindergarten Cop a brilliant movie it’s one of my favourite movies, Schwarzenegger. I’m gonna include a snippet of that in the blog post for this post, ’cause if you haven’t seen it, it’s worth seeing. [00:10:00] Now, obviously Google knowledge graph is there, the panel comes up and we’re gonna go through a couple of panels and analyse them in a minute. 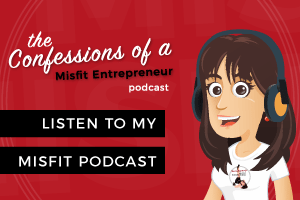 Now, why is it important, you know this podcast is aimed primarily at small businesses. Why is it important for small businesses to kind of get their information into the knowledge graph panel. What advantages can it have for a small business? [00:10:30] The small businesses, pardon me, the small businesses I’ve been working with have been asking for knowledge panels that refer to them. We had a car dealership, and when you search for their name, the knowledge panel that showed up wasn’t for the car dealership, it was for the repair shop that was attached to the car dealership. They didn’t like that at all, they wanted to sell more cars. So, they wanna be accurately represented in search results. Yeah, and it’s powerful, it’s you know when it does come up, it’s like a big fat free ad for your business with all the information that you can have about your business. So you know the more information you feed into Google, the more that’s gonna show there, and the better results for the customer and the more likely the customer is gonna call you, click through and convert. Do you think that’s right? It seems to be appearing more and more recently. 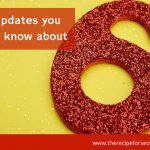 [00:12:00] I’ve been having some issues, and the US has been doing studies on them, like Eric Enge from Stone Temple Consulting, he’s been providing information through a number of reports showing that the number of knowledge panels and things like featured snippets has been growing. When I do audits for clients, I make sure I check to see whether or not they have knowledge panels. If they don’t, it’s on of the things we try to work towards. Yeah, exactly, and I think that’s … we’re gonna give some tips and advice in the rest of the show on how, if you search for your business name as you’re listening to this podcast and you’re not getting the knowledge panel card, we’re gonna talk through how to kind of work on making that appear. But, I think for those listeners who aren’t very offay with knowledge panel cards, I’ve got two examples here that we’re gonna talk through. [00:13:00] If you’re listening to this, you can head to the website and see a screen grab of these examples. I’ve got one for Barack Obama and one for the slightly less famous Kate Toon, copywriter. So, let’s have a look through these. We’ve got Obama’s first, and I think what’s interesting is you talked about the fact that with Arnold Schwarzenegger, Google is pulling in information from all different sources, from images and videos or whatever. If we look at Obama, where is all this information coming from in this panel? [00:14:30] Okay, pardon me, to go back to what I was saying earlier about that fact repository. Google started pulling information when they crawled the web by pulling facts from certain websites. In this case for this knowledge panel from Wikipedia, it’s one of the major sources of information. They’ve also included a number of quotes, which might be from a number of different websites if they can recognise the quotes as being accurately Barack Obama’s. They might have pulled them from the news, they might have taken them from magazine articles. So, they tried to focus upon sites that they referred to as knowledge bases. Wikipedia is one of those, the internet movie database IMDB is another one, there’s …. in addition to Wikipedia, there’s a site called Wiki Data, which is also … it’s mostly data from Wikipedia, all collected in one place. KATE: Yeah, so it’s looking for authority content that it feels it can trust and then it pulls that through into the knowledge panel. It’s comfortable with extracting data from places like Wikipedia and we trust Wikipedia because Wikipedia is frequently edited. So if it’s spammed, usually an editor comes along and corrects it quickly. [00:15:30] Yeah, a lot of businesses approach SEO consultants and copywriters and say obviously Wikipedia is such a source of truth. How can I get my business onto Wikipedia, you know and many people offer that as a service. It’s incredibly difficult to list something on Wikipedia and not have it immediately deleted. Do you have any tips on that? [00:16:00] Yes, I do. There are a number of guidelines in Wikipedia. One of them’s a notability guideline. If you go to Wikipedia and look up notability, they have a page about what it means to be notable. If you’re notable, you stand a chance of having an article in Wikipedia stay. If you’re not notable, it might end up getting deleted. KATE: Which is crushing for the ego, isn’t it? BILL: Well, see more than a couple of people tried to get listed in Wikipedia and did not succeed. It happens. Well, you know what I did Bill, I think about ten years ago I created a page. I screen grabbed it, and then I had my moment of fame, then it went away immediately ’cause clearly I’m not notable. I wasn’t notable then and I’m not notable now. But, one day, one day. [00:17:00] We can see in the box of the knowledge panel there we’ve got images coming up for other presidents and a picture of Ann and Vladimir and Hilary. So that’s an example of Google taking the things no strings approach, and thinking that if you’re kind of interested in Barack Obama, you’re probably gonna be interested in other presidents too. BILL: Right, they know who people search form. ‘Cause there’s a knowledge panel of me, believe it or not, and they list a number of people in the people to also searched for. Gene Roddenberry, Steve Jobs, George Orwell. It’s changed today, I’m looking at it now. You’ve still got Steve Jobs, that’s pretty cool. You’ve got Matt Cutts, you’ve got Natzir Turrado and Andrew Isidoro. BILL: There’s a little text link that says view more. [00:18:00] Yeah, you’ve got George Orwell and Tim Berners-Lee and Aldous Huxley, gosh. I put a screen grab in that, you’re famous. Those are your peers, those are who you’re measured up against. Not a bad list, I’d have all those people round for dinner, wouldn’t you? BILL: I would, I would, that would be an event. KATE: Maybe not Steve Jobs, maybe not Steve Jobs, I think he’d probably eat all the breadsticks and leave and not talk to anybody. [00:18:30] Okay, so that’s a famous person and a notable person, Barack and you are doing pretty well. But what about us regular Joe’s. 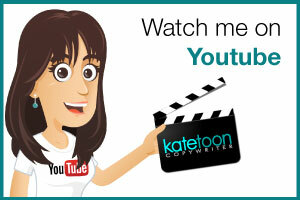 I’ve got the knowledge panel here for my copyrighting business of old, Kate Toon, Copywriter. Now this is what most people listening will see if they get to the point where they type in their own business name. Where is all this information coming from. There’s nothing there on Wikipedia obviously, so where is Google pulling all this data from? [00:19:00] Okay, there’s a Google associated site called Google My Business, where you can verify that your business is a real business and give them your address. Tell them a bit about your site, send them some pictures and that’s one way to get yourself a knowledge panel if you’re a business owner. 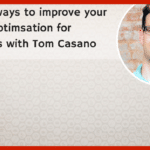 [00:19:30] Yeah, we did an excellent episode with Tim Cappa, all about Google My Business, so if you haven’t listened to that yet, do check it out. So you can see from this panel if you’re looking at it on-line. 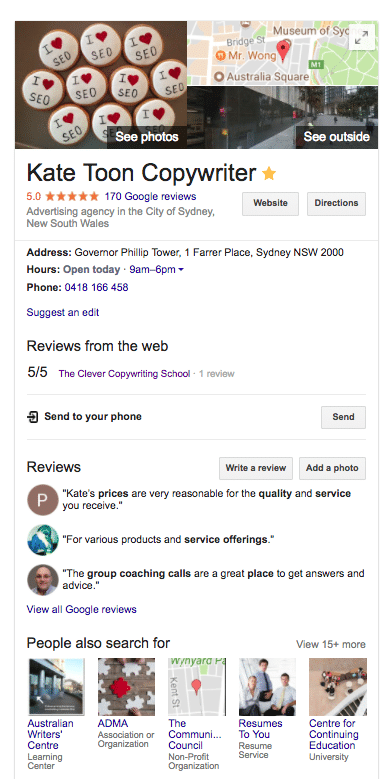 You’ve got the reviews that are coming from My Google My Business page, the address, the opening hours. 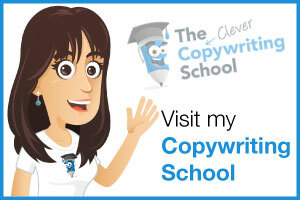 We also have a review from the web for the Clever Copywriting School, which is another business of mine, so that is not coming from Google My Business. That’s actually coming from True Local, so this panel does call in data from other sources as well doesn’t it. BILL: Right, they will sometimes include reviews from places like Facebook. They don’t actually include text from those reviews, but they link to them. and it depends what type of knowledge panel you. So, I’ve got another example to look at in a minute, but if for example you look for knowledge panel for a hotel, you’ll find that Google has pulled in information from like other hotel search sites, like Hotels.com and Trivago. 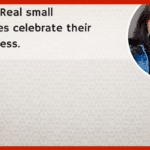 So it does depend on what industry you’re in. If you search for a movie as Bill said it will pull out information from IMDB, so, but for small businesses listening, one of the easiest way to get a knowledge graph panel is to set up your Google My Business page and try and make that Google My Business page as complete as possible. You know, put photos up. People often come to me and say, the photo that it’s chosen is not a photo that I’ve uploaded. I really don’t like that photo. I find that if you put up good quality photos yourself, Google will tend to use them, you can’t control that. Any tips on that, because often I’ve seen businesses where someone else’s photo is actually showing up in the knowledge graph. They really don’t say anywhere what criteria they follow regarding photos. But they’re never people who are googled local guides, who like going to different businesses and taking photographs and submitting them to Google and sometimes, Google will tell them how many times their photos have been viewed. So they sort of compete to get their photos used as frequently as possible. [00:22:00] Sometimes they’ll go into supermarkets or department stores and step inside and take a photograph of the cashiers or the different departments of the stores, and those sometimes get shown as the main photos. These photos often will also show up as the pictures that accompany navigation, directions in Google Maps, and if your picture is chosen as the picture associated with the business that shows up when somebody asks directions to a place, your picture gets shown a lot. [00:22:30] Wow, people really need to get out more. Imagine having the time to go into shops and take pictures of what’s there. How can you … if the image there is an image that you don’t like or you don’t want, is there any recourse to Google to say “hey that’s not an image that we want there, can we change it to an image that we want?” Is there any way of … we know that Google is very in-contactible, but is there a way of managing that? [00:23:00] You’ve chopped off the bottom of this knowledge panel for Kate Toon, Copywriter. But right at the very bottom, there should be a little feedback link. If you click on feedback links and tell them something, they sometimes respond to it. Like, there was a picture of me in a knowledge panel for me that I updated on my website, and they weren’t updating in the knowledge panel. So I used the feedback link and I asked them if they would update it, and within a week or so they did. KATE: It is possible, you’re there now with the blue shirt and the red tie, is that the one that you want? That I think may be the one I added, yeah. KATE: Yeah, cool, you look good, it looks good on you though. Finally, we’ve got a recipe one and this is interesting, I’ve got a few questions around this. 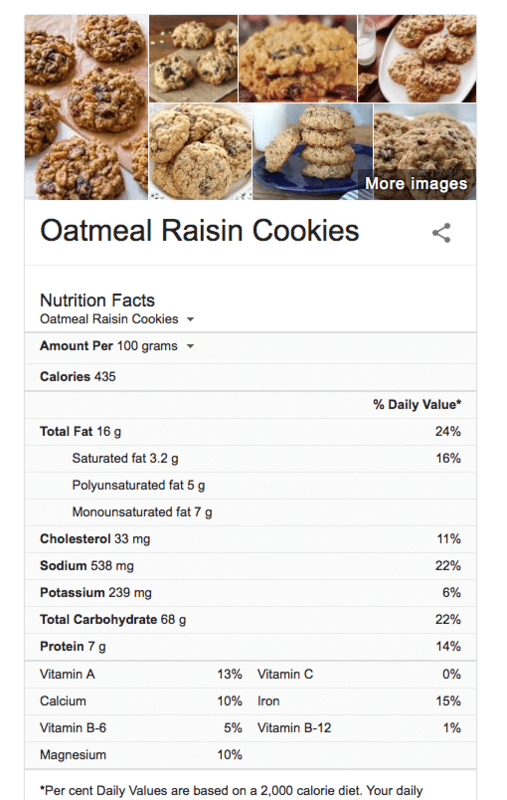 So this is a recipe for oatmeal raisins cookies, and there lots of pictures of delicious looking cookies, then we have all the nutritional facts. Sometimes you even get a little bit of a recipe there as well, so again where it pulling this information from. It’s pulling this information from a website most likely, and it’s possible that the author of the website used markup when they wrote the website that got turned into a knowledge panel. They included this saturated fat and polyunsaturated fat information in Markup. And that’s being pulled through. We’re gonna talk a bit more about markup as we go on. For those of you listening and you don’t know what markup is, so hold onto that thought, we’re gonna come back to that. We’ve talked as well about you getting panels for music and movies and other things and books as well, right. So all those things will often generate a knowledge panel as well. [00:25:00] So, of course the Google offers advice on how to enhance your sites attributes so that more appears in the knowledge graph we talked about Google My Business, we’ve also talked about adding more detail to your sites, that’s why I’m using mark-up, which is going to explain what that is. 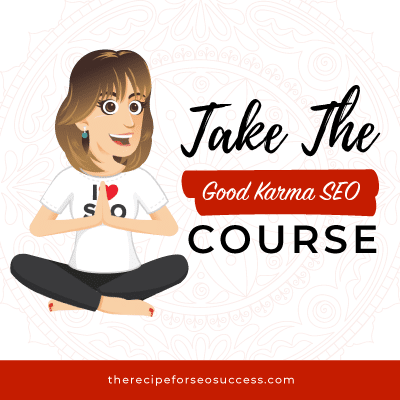 [00:25:30] So, a lot of this concept that pays in knowledge graph and is made by schema marker, and that phrase sends a bolt of terror into the hearts of most DIYs, SEOs, so you know they want to add details onto their site. Local Schema around their physical location, their contact information or their official name, their logo or their social profile information that Schema terrifies most normal humans. Obviously on WordPress there are some plug-ins you can use, but is there any easy to implement schemer? Well, the markup that you’d use on a website that in Schema is supposed to be machine readable only. It’s supposed to contain the same type of information that HTML does on your web page, but in a different format, in a different way of putting search engines only to read. It’s supposed to be the same information, if it differs, what’s on the web page and what’s in your markup are different things, Google might penalise you. So I mean implementing Schema is something a good developer can do. For those of you who haven’t heard, you can listen to the episode on Schema with Tony McCreath where we included lots of instructions and help on how to do it. [00:28:00] There’s lots of different ways you can use some of the Google Schema markup tools. There’s also, if you have a Word Press site, the Yoast SEO plug-in has a few additional options and you can get the paid local add on that can help you add some local Schema in there. But it sounds terrifying, Schema, but to be honest it’s quite straightforward once you get stuck into it. It’s just a list of tags that explain things to Google and separate that form from function and creates that things not strings approach. Now we can see on some knowledge graphs, some people have their social profile links featured there as well. Is that also achieved at Schema? I know the answer to this, but I just want you to answer it for me. That is achieved through Schema. There is a way to put markup on your page that uses what I’d like to refer to as same as links. These same as links, you’re telling the search engine, the website that you’re on has other pages that are about it. 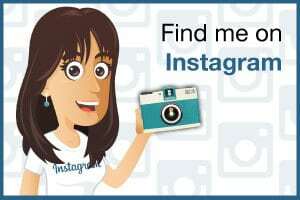 There’s a Facebook page for this site, it the same as link equals and then the HTML for the URL. Or Linkedin, your profile there, your profile at Twitter. If you include those in the markup on your site, the knowledge panel that shows your business, may have links to those social profiles, which is nice. So, Schema is our friend, we should not be afraid of it, we need to get on board with it. 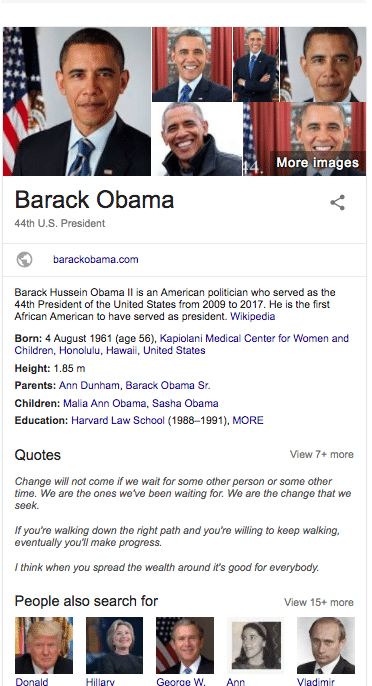 If you’re … in summary, we can see that the knowledge graph is important we’re not all Obama, so we’re not gonna get our page on Wikipedia. So if I’m a brand new business in launching today in summary, what are some of the first simple steps I can take to get my website featured in the knowledge graph and enhance that knowledge graph card? You want to make sure you have an about page where you talk about your business. On that page you want to have markup that describes more about your business, what you do, where your social profiles may be at, where the same as links are. You’ll also want to verify your business in Google My Business and make sure you give them pictures you want to show up in knowledge panel, pictures that you want to show up in a local pack, and Google Maps and people who navigate your business. [00:31:00] I thinks that enough. That’s a lot of tips, you know I think most businesses probably haven’t even done those basic things. I still find so many businesses who haven’t either claimed or set up their own Google My Business page, which is such a shame. I’ve got a different point to put to you now, though. We’re kind of raving on about knowledge panels and that they’re great and they’re really helpful. But as you mentioned earlier, things like featured snippets and answers and knowledge graph panels are appearing more and more. 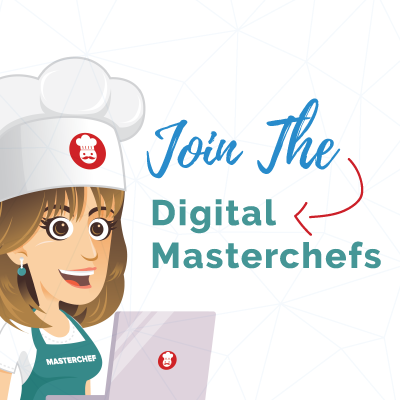 In a way this can often mean that sites are getting fewer visitors, especially in the recipe areas. [00:31:30] Often if you type in how to make blah, blah, blah, the recipe will actually come up as an answer, which means that the site that it’s printing from isn’t getting that traffic. Is Google working against us? [00:32:00] No, as a matter of fact, people have been claiming that they often get lots of leads, lots of visits from featured snippets. If you have a how to make chocolate chip cookies, and you have ten steps, Google might show the first six and then have a link underneath those that says read more, find out more and people click through. [00:32:30] Yeah, I mean I’ve found personally with the featured snippets that I have got that it improves traffic. I think for anybody listening who’s worrying about this, if the answer is a simple answer, like how old is Obama, well then no one needs to click through, you know. The answer in Google is enough, no one needs to click through for that. But for more complex questions, generally you just get like almost a teaser and then it’s an invitation to read more. So that featured snippet, and you can even be ranking quite low on the page like position seven or six, but still be the featured snippet. So you can actually out rank people by having your content chosen as the featured snippet, which is pretty exciting I think. And people are clicking through to find answers to questions like, how to tie a neck tie, how to boil water. KATE: Yeah, how to boil an egg. That’s the one I always look up. I’ve probably searched that about a hundred times. I just don’t seem to be able to retain that information in my brain. There’s too much else in there. [00:33:30] Well look I think the knowledge graph is a super powerful thing for businesses. You can augment it, and using Schema, get more and more elements in there and have almost a free ad on the side bar. Yes, of course, it’s most likely going to come up for branded search terms, but better that your site comes up instead of somebody else’s or something that you don’t want to appear. Bill, thank you so much for sharing your wisdom with us today, it’s been amazing. Speaker 3: Oh, you’re welcome, it’s been my pleasure. [00:34:00] And, we even got to discuss having Steve Jobs around for dinner, which is something that’s gonna be hard. I’d love to have you on the show again so I may badger you again in a couple of months and see if you’re willing to come back. Speaker 3: Oh that would be fine. Well, thanks so much to you for listening as well. That’s the end of this weeks’ show, and as you know, before I finish up, I like to give a shout out to one of my lovely listeners. 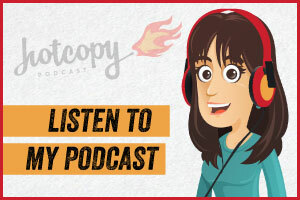 This week’s review comes from CayLow, and she says, “I first discovered Kate by the Hot Copy Podcast, which is fantastic. 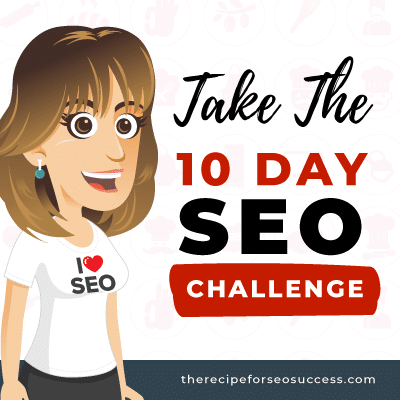 I have no interest, aka fear, of SEO, but I love how she makes it so simple, achievable and common sense. 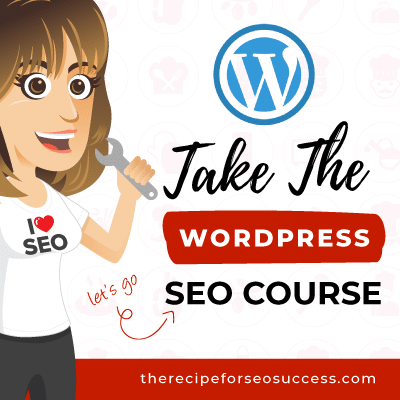 Her job is to translate it so we can apply the stuff in our own business, unlike most SEO people who want you to think it’s a dark art, so you’ll never get it.” Oh, poor SEO people. If you like the show don’t forget to leave a five star rating and review in iTunes or Stitcher or wherever you heard this Podcast. 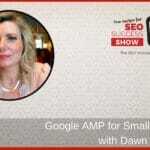 Your review will help others find the show and learn more about the lovely world of search engine optimization, and you’ll also get a shout out on the show. [00:35:00] Don’t forget to check out the show notes for this episode at www.therecipeforSEOsuccess.com, where you can learn more about Bill, check out some useful links and leave a comment about the show. I highly recommend that you follow Bill on Linkedin or Twitter, he shares an awful lot of extremely interesting content. [00:35:30] Finally, don’t forget to tune in to my other Podcast, The Hot Copy Podcast a Podcast by Copywriters or About Copyrighting hosted by the lovely Belinda Weaver, or my other Podcast, yes, I have three, I am insane, The Confessions of a Misfit Entrepreneur, where I share free stories about life running your own business. That’s it until next time, Happy SEOing.